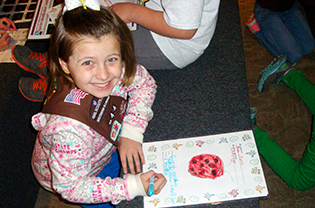 Girl Scout Troops can explore the wonders of nature at the Sophia M. Sachs Butterfly House. Additional Scouts are $8.50 per Scout, and additional chaperones are $8 per adult. Program length is 1½ hour. Programs are offered February–December on Saturdays and Sundays, during the following time slots: 10–11:30 a.m., noon–1:30 p.m., 2–3:30 p.m.
Register for Girl Scout Troop and Cub Scout Pack/Den programs at the Butterfly House by calling (314) 577-0888 x 2. We will read Clover’s Story together and then practice using resources wisely. Learn about bees and why they are so important to our gardens, and then use recycled materials to make a home for pollinators for your own garden. We wrap up by learning how to be resourceful with common household items. What can be recycled? What can be reused? We will learn ways to be resourceful every day. Meets the requirements for the Clover Petal. Learn the important roles insects and spiders play in our world. 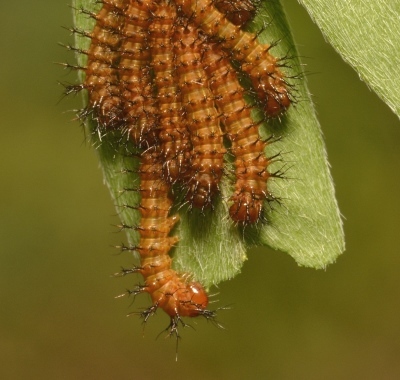 Explore their fascinating world with the help of several living insects and spiders. Girls will be given the opportunity for close study of the living animals, and we will walk through the Butterfly House to see our butterflies in flight. We will also complete crafts to learn about insect body parts, homes and behaviors. Meets all requirements for the Bugs badge. Come outside with us to engage in fun art explorations using color, music, photography and clay. Make colorful butterfly art inspired by the works on display at the Butterfly House. Learn the principles of nature photography in our Tropical Conservatory. Discover ways to make music with objects from nature. Make a small house for Brownie Elf to live in using natural things found outside. You will also get to make a small clay necklace you can take home! We will explore gardens from the tropical rainforest to Missouri native gardens. Learn the importance of healthy soil. Then, we continue by learning about insects and other animals that play important roles in the garden community. Design your own garden based on what you learned by using the tools of a real landscape designer. We will also conduct experiments to learn about necessary growing conditions and plant a mini garden to take home. Meets all requirements for Gardener badge. Join the biologists at the Butterfly House as we investigate animal habitats and learn where different kinds on animals live on our planet. Then we will take a nature walk to learn about wild animals, and we will learn about the endangered habitat of the North American Monarch butterfly. We will end back in our classroom, where each girl can make a nest for a native, stingless bee. You can put your bee home out in your yard to make your own home a better habitat for wild animals! Meets all requirements for Animal Habitat badge. Come outside with us to engage in fun art explorations using color, music, photography and clay. Make colorful butterfly art with “bleeding” tissue paper that dyes paper when it is wet. Discover ways to make music with objects from nature. Practice macro photography by zooming in on objects in our Tropical Conservatory. Design your own piece of outdoor art based off of what you have learned. You will also get to make an impression of a natural object in a small clay medallion you can take home! Come outside with us to engage in fun art explorations using color, music, photography and clay. Listen to an interview with an artist who made art for the Butterfly House, then make your own art inspired by her. Get creative to find ways to recreate natural sounds such as cricket chirps and rainfall. Learn how to capture texture in nature photographs. Think like an architect and design a structure or building in a natural space. You will also get to make a clay sculpture inspired by something you like in nature and take it home!